Ensuring your child stays safe when travelling in the car is a prime concern for parents, especially as the first journey the child is ever likely to take is the one that takes them from hospital to home. Baby car seats are classified using two different systems: the first (which is being phased out) is based on a child’s weight; the second is i-Size, which is based on height. In either case, baby’s first seat needs to be rearwards-facing. This is because rear-facing seats are better at supporting a baby’s head, forcing the child back against the seat in the event of a collision. Once a child reaches 9kg in weight-based seats (15 months in i-Size seats), seats can be swapped to forward-facing. Most first baby car seats are designed to be used in both positions. Another complication is that there are two ways to fix a child seat into a car – the first uses existing seatbelts; the second, Isofix, relies on anchor points attached to the car’s chassis. Seatbelt systems are more flexible as they can be easily moved from car to car, but can be less secure than Isofix unless fitted properly. Listed below are our top five picks for the best baby car seats available in 2018. 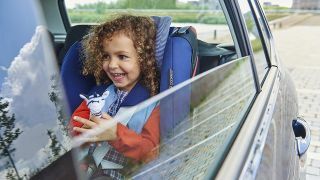 This flexible child seat system can be used both rear- and forward-facing and is designed to adapt as baby grows from newborn up until the age of 7. It includes a 5-position harness and headrest, which can easily be adjusted as your child grows, comes with a steel-reinforced frame and also boasts side-impact protection. Incredibly comfortable thanks to the use of high quality, breathable materials and thick padding, it also includes side storage pockets for baby essentials. Although it uses seatbelt fastening rather than Isofix, colour-coding on the seat makes it easy to work out where and how the seat should be fastened. The seat is easy to fit and includes an adjustable harness so your child will be both comfy and secure. One of the drawbacks of many baby car seats is that sooner or later your offspring will grow out of them – forcing you to buy another at a later stage. That’s not the case here. The Joie Every Stage will cosset and protect your baby from birth through to the age of 12, meaning this should be the only car seat you will ever need to buy. Like our No. 1 choice, the Joie Every Stage comes with a sturdy steel reinforced frame, side-impact protection and four recline positions which, along its use of thick padding and breathable materials, should ensure your offspring remains comfortable no matter how big they grow. This seat also comes with a 10-position adjustable headrest and harness system. This seat from Maxi-Cosi meets the latest i-Size safety standards with superior side impact and rollover protection, meaning baby should stay as safe as possible in the event of an accident. Incredibly comfortable and easy to fit, the only downside is that the seat is only suitable for children aged from 0 to approximately one-year-old, meaning you’ll need to buy or upgrade the seat once your child reaches the maximum height of 75cm. Parents wanting to take advantage of Isofix will also need to spend an extra £199 ish on the optional Maxi-Cosi 2wayFix Base. On the upside, the Maxi-Cosi Pebble is compatible with Maxi-Cosi and Quinny pushchairs, so transferring your baby from car seat to pushchair is super-easy. Many parents will tell you that one of the hardest things about baby car seats is getting the child to sit in it and then ensure they’re fastened securely – something that can be a particular problem if space in the back of the car is tight. The Britax Romer DUALFIX fixes that problem in two ways: first, it uses Isofix anchor points on the chassis of the car, with tell-tale indicators that let you know when the seat is securely fastened; secondly the seat itself swivels 90-degrees on its base, making it easy to place the child in the seat, or for them to climb in themselves. The seat is also incredibly comfortable, with a 1-pull harness adjuster to make sure baby is snug and secure. Like the Joie Every Stage, this seat from Graco is flexible enough to adapt to the needs of your child as they grow, with a 10-position adjustable headrest and harness, and the ability to transform into a booster seat when needed – built-in storage enables the harness to be tucked away. For safety and comfort, the Graco Milestone also comes with a steel frame and side-impact protection, and plenty of padding to ensure that your offspring remains comfortable however long the journey. The main drawbacks are that the seat can be fiddly to secure properly meaning it can take some time to make sure it’s in place. The harness buckles and clips are also a little stiff.